If you have a fireplace in your house, it can serve as an invaluable source of warmth and entertainment for you and your family. Yet unfortunately, your chimney can prove to be a weak point for your home, since it is vulnerable to wear and tear from the elements. Fortunately, you can protect your chimney with regular maintenance of its components. Now, you may be wondering, what exactly protects my fireplace and chimney from precipitation and damage? Well, there are several components to every chimney and fireplace, many of which are designed to protect your chimney from damage that can be caused by Mother Nature. Here’s a list of all of the various protective components of your fireplace, and additional information about how they operate and provide protection for your home. Your chimney damper is a component that enables you to control the amount of air that moves through your chimney. You can open or close the chimney damper (often with a lever) in order to keep cold air from entering your home (while you aren’t having a fire), or to allow smoke to exit your home (when a fire is lit). The damper also keeps animals from entering your home, and it serves as a defense against precipitation, should other chimney components fail to keep moisture out. Your chimney flue lines the inside of your chimney. Most modern chimneys are outfitted with a flue liner which protects the bricks from damaging smoke or precipitation that can pass through the chimney. If you have a flue liner, you’ll notice a liner made of thin steel sheets or made out of tile (although steel is more common). Your flue should be cleaned regularly to ensure that residue doesn’t cake up on the surface of the flue, which can reignite and create a fire hazard for your home. 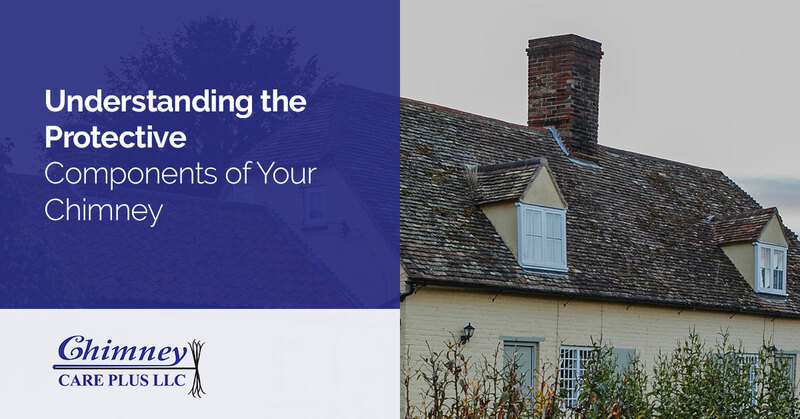 Your chimney crown rests atop your chimney, and it protects the top layers of bricks from premature wear and tear that can be caused by weathering. Your chimney crown is likely made of mortar or concrete that is applied on the uppermost layers of bricks on your chimney. Since the top of your chimney may be exposed to the brunt of damage that can be caused by rain, hail, and snow, as well as wind, the crown helps to defer these things that would otherwise be damaging, so that your chimney top can last as long as the rest of the bricks that support it. Chimney caps are designed to keep water, debris, and animals from entering your chimney, while still allowing smoke to flow out. Most modern chimneys are outfitted with a metal cap which serves as a small protective “roof” over the opening of your chimney. The chimney cap is adhered to the crown of a chimney, and its metal components keep water from flowing into the opening. In addition, caps are designed to keep embers from escaping your chimney while you have a fire in the fireplace. 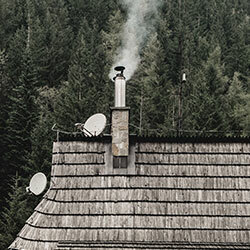 Like any other part of your house, your chimney will require maintenance from time to time, ensuring that you don’t have precipitation running into your home while keeping your chimney lasting as long as it should. You can count on the chimney experts here at Chimney Care Plus to ensure that your chimney is in its best shape, so that your home remains protected, and your fireplace remains operable for decades to come. Give us a call today to learn more about what we can do for your roof, and to schedule an appointment for service!